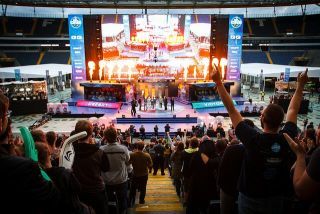 The ESL says it will update its policies to more directly address the use of performance-enhancing drugs by professional gamers at its tournaments. The move comes in the wake of comments by former Cloud9 player Kory "Semphis" Friesen, who said in an interview earlier this month that he and his teammates had taken Adderall, a psychostimulant which is used to treat ADHD and narcolepsy, while competing at ESL One Katowice. "I don't even care. We were all on Adderall," Friesen said in a surprisingly frank admission. "It was pretty obvious, like, if you listen to the comms. Like, people can hate it or whatever." Even more surprising, the interviewer then interjects with, "Everyone does Adderall at ESL One, right?" to which Friesen replies in the affirmative. A bit of sheepish laughter follows. Whether or not that's true, it runs contrary to section 2.6.4 of the ESL One Rulebook, which states, "To play a match, be it online or offline, under the influence of any drugs, alcohol, or other performance enhancers is strictly prohibited, and may be punished with exclusion from the ESL One." But that's the extent of its policies regarding PEDs (performance-enhancing drugs) and so in response to Friesen's comments, the ESL said changes are coming. "The integrity of our sport is and always will be our biggest concern," ESL Head of Communications Anna Rozwandowicz told Wired. "When we first saw [Friesen's comments], we focused immediately on kickstarting a policy-making process and adjusting the rules. We have worked on changes in our rules, reached out to authorities for support, and will be ready to announce our next steps in a couple of days." As for Friesen's case specifically, it's unclear what, if anything, will happen to him. The rules don't currently set out specific punishments for infractions, and there's no precedent because, according to Rozwandowicz, no one's ever been caught (or admitted to) doping before now. She also pointed out that there's no proof Friesen isn't just trying to cause grief for Cloud9, which cut him loose "due to his and [the] team's poor performance." And there's no way to get that proof, since ESL One Katowice took place four months ago. "We're taking the steps to level with traditional sports, and it's going to take a while before any esports organization will administer regular drugs tests. We hope to speed this process up by proactively seeking advice from authorities and starting small," Rozwandowicz said. "Full blown drug tests at esports events are far away, but that doesn't mean we can't and shouldn't try to tackle the issue."